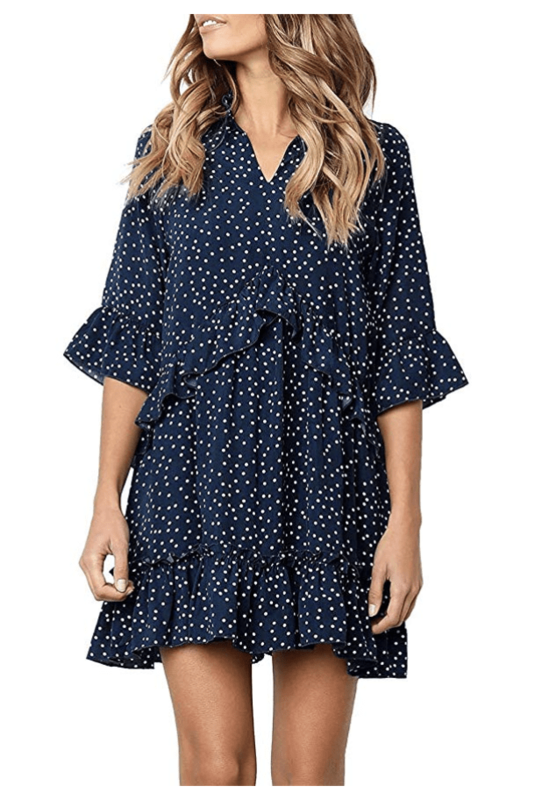 What if I told you that I bought this Ruffle Polka Dot Dress for just $20? Can you believe it? I absolutely fell in love with it when a friend of mine posted it on her Instagram stories a few weeks ago. For $20, I was willing to take a chance on fast fashion and thank goodness that I did because I wore the outfit yesterday and it was perfection. Spring dresses are super fun to shop for… if you have a certain body type. And guess what? I don’t have it. I am always trying to layer up my clothes in an attempt to look thinner. Very rarely do I ever go outside with JUST a dress. It’s usually a dress and a jean jacket or a dress and a cardigan. But this ruffled number had enough layers to fool the eye and work with my frame. The best part about it all is the fact that I bought it on Amazon which meant that I received the item in around 2 days! Woo hoo! Viva la PRIME. I chose navy because it’s a very versatile color, but this dress comes in so many different colors. Go crazy and check them all out to see which one suits your personality best. Here’s what the spring dress looks like on the model. I am sure she is wearing an XS. I am in a Medium in case you are wondering. A lot of people have texted about what the fabric is made of and it’s 30% cotton, 65% polyester, and 5% rayon. Garment Care: Hand wash with cold water, do not bleach, hang or line dry. And by the way, after I received the dress, wore it out, and then tested the piece on a full-blown day, I came right home and ordered a second one. But this time, I chose the sleeveless version and I got it in red. I like to dress up and do a little Disneybounding and I thought this would be a fun Minnie Mouse dress! Don’t you think? It’s a twenty dollar dress. Just keep that in mind. This isn’t a J.Crew dress. This isn’t a designer garment. 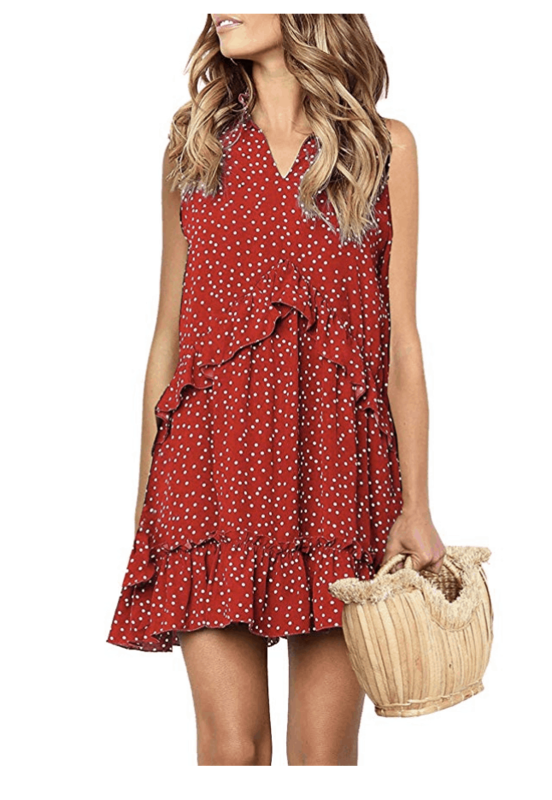 This is literally a twenty dollar dress that is super cute for spring… but I am not telling you that it is going to last for the rest of your life. I’m also not telling you that it’s going to fall apart while you are wearing it. If you shop at Target, this is pretty much in line with their clothing. You will get a few years out of it and then you will move on. This isn’t a dress you will pass down to your daughter. This is full disclosure!! With my wardrobe, I have high and low piece. I own a Gucci belt that I will be buried in and then I have a $20 dress from Amazon that will get me through a bunch of events and then we will part ways with lots of great memories. So, what do you think? If you want to see all the different accessories that I think could go with this polka dot piece, check out my LikeToKnowIt account post about this outfit. I included bags and shoes that are SUPER CUTE!!! Previous Post: « The Best Country Ham For Easter – Plus Enter To Win A Ham Of Your Own! Wow! The spring dress for girls is awesome. I am very fond of shopping and it’s high time that I have not bought something for myself. Surely, this will be in my list.